Ke Ga Lighthouse was built in Ke Ga Cape, Hon Ba Island, Binh Thuan Province, Vietnam. This is the most favorite destination for visitors to Binh Thuan Province. Ke Ga Lighthouse was designed and contributed by the French. The lighthouse was built up from 2, 1897 to the end of 1898. It built of granite stones brought from France. A unique character of this lighthouse is that the granite stones were carved out of different shapes, sides, sizes that are well-fit. So in building, they were put together without mortar or plaster. Ke Ga Lighthouse consists of up to a 183-footstep steel spiral stair to the top of the lighthouse. On the lighthouse, there is a big light of 2000W, which was brought from France. To get in the lighthouse, you will be experience the felling on “thuyền thúng”, a special kind of boat made from bamboo. Sometimes, if you get lucky, only 500m from the coast, you can walk to the island when the tide is out. Presently, Ke Ga Lighthouse has become a tourist attraction, not only about art and architecture, but also a beautiful natural landscape. Visitors can explore the lighthouse and climb to a viewing platform near the top for great views of the coastline and enjoy a fabulous view of the open sea. The light house is about 60m tall. From that height, visitors are able to see a vast expanse of sea and sky, as well as enjoy cool ocean winds. From the top, visitors can also see beautiful marble rocks, beaches, resorts that are nearby the lighthouse. In addition, around the base of the lighthouse, there are two ranges of porcelain trees which have been grown along the paths by the French since the last century. The most beautiful moment to visit the lighthouse is at sunset. Visitors also can stay on the island overnight to go fishing in the moonlight. Moreover, you will be tasted the grilled seafood that you have caught by yourself and then stay up to see the first sunlight. This will be an unforgettable experience for you. The unyieldingness and aggressive fighting of the citizens of Cu Chi are maintained by a tunnel system – multilayer tunnel up to 200 km in length, continuously constructed by Cu Chi citizens for many years with innumerable tunnel doors up to the ground, holes and secret fire powers, sheds, underground workshops, warehouses and barracks, plenty of mine, and traps are arranged on the upper levels. The description about Cu Chi tunnel is very simple: these are underground fortified position systems, such systems are disguised very deeply and thoroughly in the tropical forest. The purpose is to release the sudden attacks towards the enemy during the American war in Vietnam. The tunnel and fighting systems are carefully researched with the consideration of attacking and destroying the enemy from all angles. The complex network of the tunnels runs in chain and scattering in all directions from the main tunnel axis and branching into innumerable ways; some branches are the secret sheds, others can be the dead ends due to the special topographical conditions. Smart Vietnamese guerillas created tunnels which are not very deep to save time and effort with the consideration that although tanks and armored vehicles moving on the roof of the tunnels and the upper section are bombarded with bombs, tunnels are not collapsed to serve those as the builders. Up to now, the complex multilayer tunnels remained unchanged as it was during the war time with the secret tunnel hole covers and doors, connected among the underground ways. In the tunnel system, there are special closed buttons at different locations used to prevent against enemy or the toxic gases. Throughout the length of all tunnels, there are secret ventilation holes connecting to the ground and secretively disguised. One part of the secret ventilation doors can be used as the secret power point as the biggest surprise for the enemy. As for the smart guerillas, this is far from enough; tunnels and roads towards the frightening traps in combination with the bamboo tunnels and other dangerous holes and traps are also arranged. The connection into and out of the tunnels are arranged with the mines against armored vehicles and tanks as well as ground forces in such a condensed and intermingling manner to assure strict confidentiality and absolute safety. During the war, even an army or citizens of a village can be contained in the tunnels which helped the Vietnamese to protect many lives. In the tunnels, there are warehouses to keep weapons, bullets, and other explosives, food and foodstuff and the battle field medical facilities, non-smoke stoves (Hoang Cam stove), hospitals for the injured, underground chambers- rooms, steering committee, places for shelter and daily activities of women, children and the elderly. More accurately, this is not a village but a city inside the earth. Even during the war, the Vietnamese people do not forget the culture and education: the chambers are equipped with classrooms as places used as the cinemas to show the revolutionary films and artistic performances of the battle field singers. Especially, many secrets exit in the world inside the earth. Using the strategic bombarding air-plane B-52 and heavy artillery, the American attacked Cu Chi area for many years without any fruitful results as expected despite innumerable bombings and bombarding, Cu Chi is still a dead land for the American marines and Saigon armored group; the American was forced to creep into the dark tunnels. Unlike films of Holy-wood (tunnel rats) that are selected from the small, thin but courageous soldiers, ready with a short gun to creep into the death world full of dark. In the tunnels, waiting for the American soldiers is the stuff atmosphere covered with dark, traps, poisonous snakes, scorpions, followed by the brave and skillful guerillas. 3-floor tunnel system is dug inside the solid clay ground by the rudimentary agricultural tools of groups after many generations of Cu Chi; each tunnel digging team includes 3 or 4 people. One person is in charge of digging, one person removes soil from the tunnel to a vertical deep well, one person pushes the dug soil bucket to the upper location, one person carries it to somewhere else and secretively hiding under the trees or discharging into the river. When the work is done by the digging teams, a bamboo tree is placed at the well as the ventilation hole, then the dug well is filled and the ventilation holes are disguised in form of a termite net or decayed tree foot or any other shapes…. The American decided to use the hunting dogs in search of the ventilation holes and ways in and out of the tunnels. The Cu Chi guerillas used clothes of American soldiers which are usually the M65 overcoats (called the American shirts by the Vietnamese) and being thrown away by American soldiers in case of injury or bandage. At time of discovering the familiar smell of the American soldiers, it is often overlooked by the hunting dogs. After that, the guerillas used the small grilled pepper to make the smell sense of the hunting dogs useless or using the American soap with longer use to defraud the hunting dogs of the enemy. In many cases, the secret tunnel doors are found, the American soldiers tried to pump water or gas CS (as the tear gas) into the tunnels. However, the multilayer and niches of the tunnels with innumerable closed doors and overflooding tunnels have made the efforts of the enemy useless; and the Vietnamese guerillas only simply lost a tunnel road section, falling down the walls of the close tunnel roads to block both ends and forgetting this tunnel road section; they dig another tunnel road passing and all efforts made by America soldiers brought about no fruitful results. 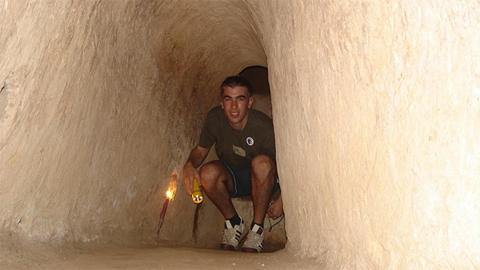 During the war, Cu Chi tunnels are not only a fortified position, a shelter but also acting as a workshop army engineer providing war weapons, and equipment of rudimentary and modern combination aimed at decimating enemy. As for guerillas, steel and explosives are precious tools which were regularly provided by American via their bombarding (only with a suspicious sign- light, smoke, sound…), B52 bombs will be released immediately to wipe out the trees in the area turning the immense zone into a surface of the moon. The brave guerillas collected various bombs from the small to the larger ones which are cut into pieces used as explosives and the small ones like 105, ball bombs are used as self-made mines. Steel is used to create the bamboo edges and sharp nails to serve the traps and other battle field tools. Apart from the workshop army engineer, there are collective dinning room, Hoang Cam collective stoves, sewing shop for military and civil purposes in the tunnels. The Vietnamese dense forest and Cu Chi iron soil contain a lot of frightening surprise for the enemy which can be self-made mines strong enough to destroy M41 tank or the self-made rudimentary traps used by Holywood in its famous war films. In reality, such weapons have been displayed in Cu Chi museum. During the war against the American, rudimentary weapons played a pivotal role which defeated the invasion will of the enemy. Let’s have a look at the self-made frightening weapons used by the Vietnamese against its invaders. The Vietnamese traps are the self-made rudimentary weapons which are extremely dangerous and efficient making American expeditionary forces lose a lot of vigor. We must use the similar weapons one day in the future. Tiger trap – GIS (American soldiers) is moving smoothly and gently in the roads and surprisingly, his feet was collapsed deep inside the land and American soldiers fell into a hole filled with bamboo spikes or sharp spikes. If the soldier is lucky and is not dead immediately, he will loudly scream due to terrible pains and the remaining soldiers will congregate to pull him up from that dreadful trap. Normally, surrounding the bamboo spike holes are secret doors and fire power of skillful guerillas. Vietnamese souvenir as the spike- a technological self-made weapon. In the deep hole, there are cross steel spikes followed by a round board at the upper end with stretching parachute ropes, being connected with sharp and long steel nails. When GIS set his foot on the holes to be thoroughly disguised by dry leaves or lawn, the feet are collapsed pulling with the thin boards and steel nails from 4 directions stabbing through the thighs and ankles; it is impossible to pull up the injured from the holes unless further digging is done and steel nails are removed at the same time. In that case, soldiers might not be dead but his whole feet are seriously injured. It is a must to bring the injured persons back to the hospital in Saigon for operation; the soldiers are granted with steel nails as a souvenir; therefore, such spikes are also referred to as the Vietnamese memory. Bamboo frame – a spike with a false frame structure; the sharp edges are responsible for stabbing through the ankles making GIS unable to move. The bamboo frames are usually soaked in the water rice field or muddy roads. The soldiers jump from the helicopter or the canoe and…. stand still with the steel frames stabbing deep inside their ankles. Some self-made weapons are not purely antipersonnel but also creating nightmares for the remaining soldiers so called rotary axis spikes. Steel nails are installed on the freely rotary axes and many holes in the body are created when setting foot on them. For those breaking into the building without knocking the doors or breaking the doors by a kicking of the steel shoes, the Vietnamese guerillas are willing to grant them with a special structure spike as a simply two –bar T mutually connected in form of rice threshing anchor style tied to the ceiling and attached to the doors; when the doors are opened to its full, the spikes will be fallen down and GIS will be taken straightly to the hell if he raises his gun to protect himself in such a timely manner, his body from the thighs and belly will be injured surely. Wing spikes- this is a very simple spike which is manufactured by young guerillas during practicing time. The principle is really simple. Two boards are placed together with steel spikes installed into a small hole of two stairs and when the enemy set his foot on this hole, the dirty sharp nails stabbed into the ankles and without a doubt, the pain will be infected resulting in infected blood if the injured is not brought to the hospital in such a timely manner. Mortar – rod spike – being made under lever principle. Sharp steel spikes are installed on the boards at both ends and when the enemy set his foot on one end, the other end will be in rebound and stabbing into the chest and head with spikes. Armpit spike is made from the two boards filled with sharp and long steel nails which can move from both directions and being mutually attached via rubber ropes or spring. The two boards are extended and propped by a horizontal prop as the hard bamboo. When American soldiers set their foot on the holes and the props, they will fall into the holes and use his two arms for self- protection, at that time, the two boards filled with steel nails will move in the middle towards the body of the falling persons. Rake spike – widely opening doors to welcome GIS; this trap is simply made. Only two bamboo pipes are attached into T shape and the horizontal bar is filled with long sharp spikes; the spikes are hung highly connected with the small ropes from the ground – the fishing line is usually used for hard recognition; when the enemy goes inside and caught by the line; the spikes will stab through his feet or thighs. Additionally, the door spikes are automatic ones with structure similar to the traps as aforementioned depending on the specific situation and topographical conditions for arrangement accordingly. In the dense tropical forests undamaged by the bombs, American soldiers might fall into the big animal hunting traps. 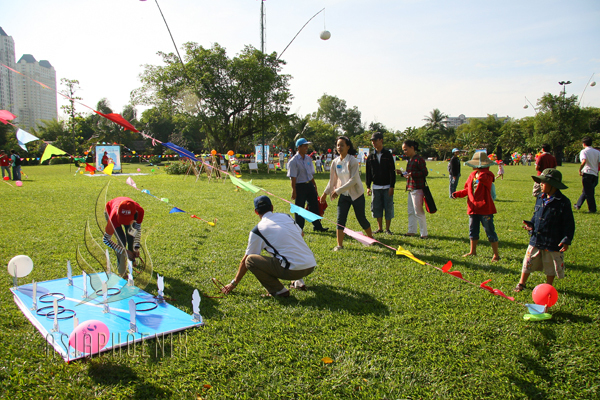 Rebounding rod trap – using one bended old bamboo tree, the tree body is installed with bamboo bars or sharp wood pieces, tied to a bracket for tightly connected to the trap rope as the fragile fishing line at the ankle level. When the enemy falls into the trap rope, the pin of the rebounding rod will be released by the stretching ropes; bamboo bars, sharp wood pieces will stab into the body of the unlucky soldiers. Normally, the soldiers will be mortally wounded immediately. The hanging spike trap similar to the rebounding rod trap is like a wood piece, stone bracket or stone bale filled with bamboo spikes or sharp steel installed or hung on the high tree body beyond the eye level, connected with the trap ropes; when the enemy falls into the traps or strongly pulled by the Vietnamese guerilla; the wood pieces and the stone bracket filled with sharp spikes will rush in the victims; this method is used to attack against the crowded groups. The falling spike trap similar to the hanging spikes is a plate made of old and hard bamboo pieces filled with sharp spikes, installed with heavy items like stone and bricks to strengthen the attacking power; when the enemy falls into the trap, the spikes will rush in along with the stone and bricks to make the opponents seriously injured. Apart from the relatively complicated spikes, American soldiers have to face extremely dangerous self-made weapons and the antipersonnel weapons are innumerable from the wild beast hunting tools and speculum grenade to bullets 7.62mm, 12.7 mm; with further creativity, such tools are deadly traps. Sharp head trap- as a combination between crossbow of Tay Nguyen people and oblique launching pipe of the North; the head is compressed by the spring or placed at the launching platform of rubber ropes; the brake pin is released and the contaminated head as the lubricant or fishing line stabbing horizontally into the body or the ankles, thighs and undoubtedly, blood is infected. Straight bullet trap as a bamboo pipe fixed into a steel plate with a ball spring and bullet. This trap is installed in the path; when American soldiers set their foot on, the bullet will go down; the best case is that the bullet passes through the foot and the worst case is death. Grenade trap: the speculum grenade is put into a small round bamboo pipe horizontally tied in the bush or soaked in the muds or canals; when the marines or the raiders fall into the ropes, the grenade will be released and apparently, painful landscape will happen with the unlucky soldiers. 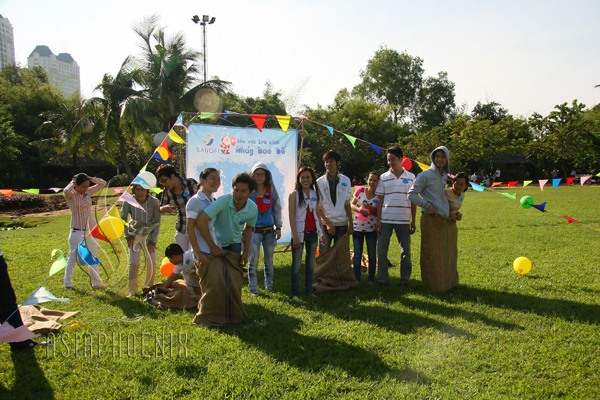 Binh Quoi tourism village III is located on the Thanh Da peninsula, surrounded by the Sai Gon River, 4 km from downtown. 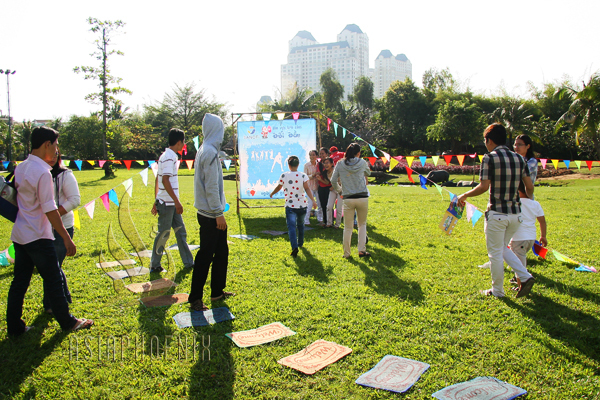 Binh Quoi tourism village III is a relaxing venue outside the hustle and bustle of HCM City. 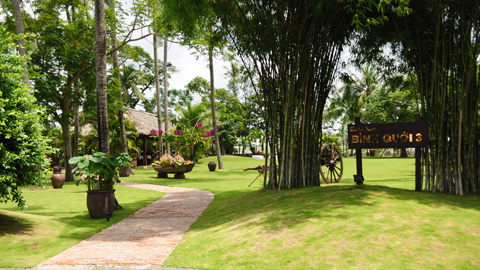 Large spaces of green grass and rows of coconut trees are reflected along with the entrance road, creating a peaceful, quiet and green grass space. The village is lined by brick-paved paths. A bamboo bridge covers a small canal, a wooden bridge is placed near a pond full of lotuses and water lilies, and hidden cottages can be seen under old bamboo hedges. Getting here, visitor’s eyes will be caught by the beautiful landscapes, one after another, such as the green grass field, the lake, the waterfall, coconut trees, creeks, and thatched cottages. It’s a peaceful place, where to get away from noise and traffic. The village represents the look of an ancient village’s traditional festival with lanterns, a small peaceful river and small boats. Folk music performances are held at night and the site often hosts traditional wedding parties. You not only can relax in a peaceful environment, you also can enjoy southern traditional food buffet. In addition, water-skiing, fishing, tennis and swimming are also available in the tourist village. Located near the river where soft cool breezes blows, the romantic restaurant features candlelight dinners with lanterns strung from trees and wild orchids. Quan Xua is definitely one of the most diverse and unique restaurant experiences in the Saigon and in Vietnam. Customers are taken into a whole another world of the Mekong Delta not too far from the city centers. Quan Xua restaurant with many Vietnamese specialties and international cuisine is often used for parties. Grilled dishes are considered to be the most delicious on offer. Besides, small boats loaded with fruits, vegetables and traditional cakes can be seen at the riverside, calling on visitors to taste and buy. Binh Quoi village III is great for families, friends, contains a swimming pool, karaoke rooms, tennis yards, fishing ponds and guesthouses. With the beautiful ancient trees, immense green lawns, clear blue swimming pool, Van Thanh Tourism Area is like a blue island bounded within Saigon. Roughly 2km from the heart of Ho Chi Minh City, before setting foot in Van Thanh Tourism area, you will feel like leaving the city for a peaceful rural area. This is somehow like a village with ancient trees of big leaf canopies to shadow the roads; the rickshaw is waiting for the owner to fill the goods; the lawns are immense stretching to the horizon, flowers are in full bloom to lighten one corner; the landscape is beautified by small bamboo bridges over the canals. Within the peaceful and quiet atmosphere, the tourists will only want to lie down on the green lawns next to the clear lotus ponds, closing their eyes to listen to the wind blows over the banana trees to dispel all exhaustion and tension of the daily life. 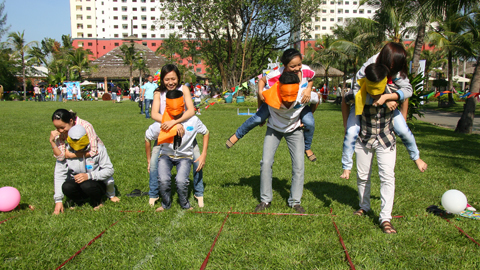 With the large and tranquil space, professional staff cadre and location not far away from the heart of the city, Van Thanh is the best choice for the corporate events including team building, family festivals, year-end staff parties…. 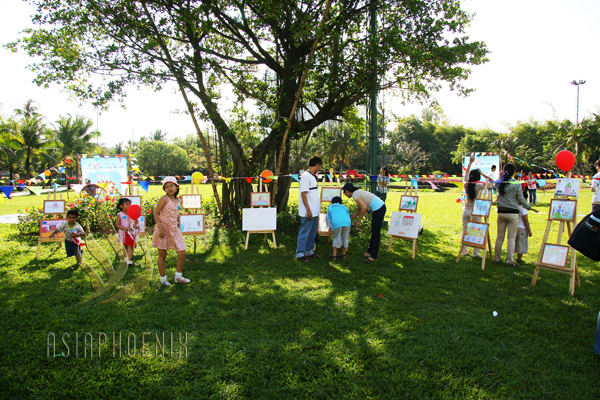 Please do not hesitate to contact Asia Phoenix Events for event organizational consultancy at Van Thanh Tourism Area.